For the benefit of our readers, what is Atomic Layer Deposition? Atomic Layer Deposition (ALD) is a thin film fabrication process during which vapor phase precursors are separately and sequentially introduced to a surface. Each precursor reaction with the surface changes the surface functionality to a new functionality. This is then reactive with the next precursor in the reaction cycle. Each reaction is also self-limiting so that the gas-surface reaction stops when all surface sites are converted. Each reaction cycle produces a monolayer of coating that covers all topographical contours of the surface. The self-limiting and cyclical nature of the ALD process makes it superior in its thickness and chemical precision compared to other thin film fabrication techniques. What types of ALD are there? ALD is known for inorganic coatings and many chemistries have been demonstrated including metals, oxides, nitrides, sulfides, fluorides, and so on. Molecular Layer Deposition (MLD), which is equivalent in concept apart from the process sequentially deposits monomers, can similarly deposit polymers such as polyamides, polyureas, polyesters, etc. The tunability of the ALD/MLD process also allows for multilayers or different materials, complex compounds, hybrid organic and inorganic materials, and alloys. In addition, ALD can be deposited onto many different kinds of surfaces, the most famous being wafers for the semiconductor industry, but also polymer films, textiles, and at Forge Nano, powders and porous materials. In the laboratory, for small sample demonstration, ALD is commonly done via a batch reactor. This is usually done using a simple cross-flow reactor for wafers, or a fluidized bed for powders. In these cases, the substrate materials are put into the reaction chamber and entrained into a gas stream that flows over samples (or through the powder bed, in the case of powders). The precursors are entrained separately and sequentially. This type of ‘temporal ALD’ system is extremely versatile in the process conditions and the types of chemistries that can be applied. However, as a batch process, the throughput is not very high. For high throughput manufacturing, we use “spatial ALD” in which the precursors are instead separated into zones and the substrate materials are moved through the zones. From the substrate perspective, the experience is the same: exposure to the first precursor and then later, the next one, but this allows many batches of substrates to be coated simultaneously in assembly-line fashion, increasing the throughput substantially. High throughput spatial ALD is opening up entirely new application spaces for ALD on industrial powders and porous materials. How are surface coatings effective? Interfacial effects impact many materials attributes. For example, the reflectivity of a material is a function of the interaction between the surface of the material with light. In another example, the dispersion of a powder in a solution depends on the interaction of the particle surfaces with the solvent, and the strength of that interaction relative to the surface of one particle with the surface of another particle. The greater the surface to volume ratio, the larger the impact of surface on the bulk properties of the material. For powders where there is a very high surface to volume ratio, the impact of modifying on the outermost surface layers with a coating is huge. From the examples, the coating can change an absorbing material to a reflective one, or the viscosity and loading of a disperse powder slurry. Other properties include: corrosion resistance to moisture or other chemical contaminants, thermal or electrical conductivity, mechanical strength and structure, adhesion or lubricity, or porosity. Due to the unique attributes of ALD, including sub-nanometer control of thickness and chemical composition and precision surface conformality, ALD is a superior technique for manipulating these interfacial effects. What applications can ALD be used for? There are so many applications for ALD that have already been demonstrated at the bench scale. It’s ALD manufacturing that is really behind. Forge Nano specializes in manufacturing-scale powder ALD, in terms of coatings on particles: coatings on anode and cathode powders for lithium-ion batteries or ultracapacitors; ALD onto catalysts or deposition of active materials on catalyst supports for enhanced catalytic function. Why is ALD so effective in Lithium-Ion Battery materials? 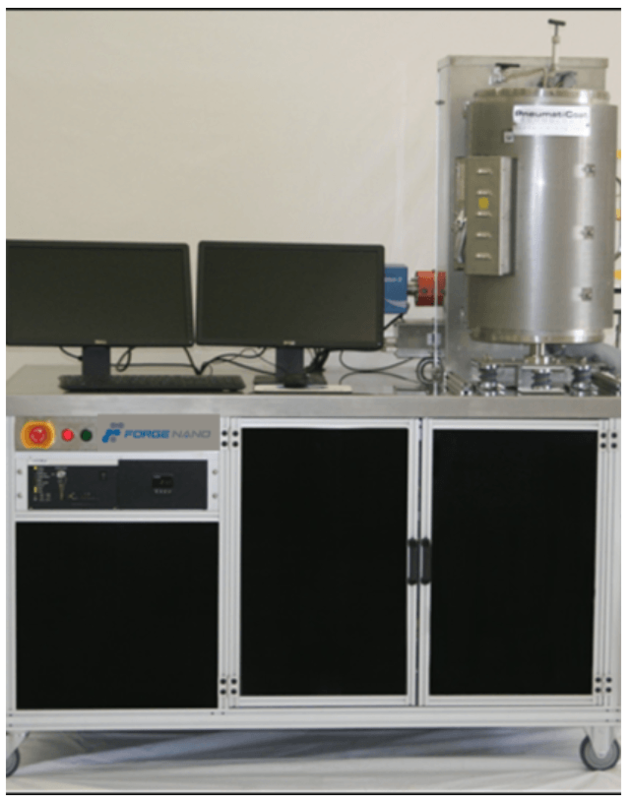 Through our own R&D at Forge Nano, we have observed these enhancements as a function of ALD coatings on anode powders, cathode powders, solid state electrolyte powders, and separator materials, or the combination thereof. This has resulted in an increased cycle life and reduced capacity fade, increased ionic or electronic conductivity, greater stability under high voltage operation, greater capacity retention under fast charging, greater stability under high temperature storage and extreme low and high temperature operation conditions. As well as protection from interfacial side reactions, low gas generation, greater moisture resistance, modified interfacial thermodynamics, high temperature resistance to thermal runaway, and abuse tolerance. Battery systems are complicated and there are a lot of different combinations of battery materials for different types of application. Not every battery experiences every degradation mode and by corollary this entire list is not observed in every battery system with every ALD coating; but it is enough to generally say that ALD coatings benefit LIB performance. What does Forge Nano offer to get these types of results? Our goal is to get ALD products out in the market space. We benefit greatly from development partnerships to identify an ALD solution to a specific customer pain point, and then develop that exploratory work into a manufacturable product. We provide R&D services at the front end of a project. We do toll coating at all scales (grams to tons) and can manufacture powders at the ~1-3 ton/day scale in-house. We sell commercial-scale equipment to facilitate manufacturing at the customer facility and to be able to integrate the ALD process into an existing manufacturing line. For those customers that prefer to do materials R&D on their own, we also sell a suite of laboratory-scale fluidized bed tools to facilitate materials exploration. What support do you offer customers with your systems? Our laboratory-scale systems include installation and basic training to operate. We also provide additional R&D and application consulting services to help further your research or development efforts on an ongoing basis. We also offer service agreements to ensure downtime is limited and research time maximized. For commercial-scale systems, we offer the same installation, training, service and consulting. We are also working with partners to bring our customers a turnkey full product solution to include the equipment as well as precursor safety, storage, distribution, and supply. Where can our readers go to find out more about Forge Nano’s products and research? Readers can contact us with questions and comments through Azo Network or via Forge Nano’s website, www.forgenano.com. Dr. Arrelaine Dameron is the Director of research and development at Forge Nano, a materials manufacturing company in Louisville, CO. She is a world expert in thin film deposition, nanoscale assembly and interface engineering, specializing in energy generation and storage applications. Arrelaine has over 15 years of experience in materials science and chemistry, has produced more than 50 publications and several patents. Dr. Dameron has a Ph.D. in Chemistry from Pennsylvania State University and a B.S. in Creative Studies from University of California at Santa Barbara.